Last week I spoke at TechTarget's Modern Infrastructure Decisions conference in New York City. My topic was about the Consumerization of IT, specifically ten things you can do to start to address consumerization in your organization. First, we can't trust a device just because it's inside the building. Devices are small and portable and easy to bring in, and there are too many "FUIT" ways to get around protections meant to prevent untrusted devices from getting the network. (MAC address spoofing to fool NAP/NAC, setting up rouge access points, jailbroken devices that lie to security scanners, etc.) So just because a device is inside the boundaries of the building doesn't mean we can trust it. The way I see this is that you basically open up your corporate user-land network to any device. Just make it wide open. (Or use basic WEP that prevents randoms from poaching your WiFi from the parking lot.) So you're essentially provide generic internet access, just like a user would have at home, the airport, on their 4G card, or at Starbucks. You don't have to worry about or police every single device that walks through your door. Users have the same experience everywhere. No "do it this way from the office" and "do it this other way from home." You don't have to worry about rouge 3G connections or wrap your building in copper mesh. You can wrap similar security around your resources regardless of where they are—in your datacenter, at a remote site, cloud-hosted services, etc. Your users connect the same way to all. "But then one rouge user could take down the whole network!" Oh please... If Starbucks or the local football stadium can figure out how to provide WiFi for the general public (hackers included), then so can you. Sure, if you have 1997-era Aironet access points then yeah, there's no QoS and one bad (or hacked) user could do some damage. But if you put each user on a VLAN, get some modern wireless gear that with enough capacity to support several devices per employee, and you do some QoS and traffic shaping, then you're fine. Again, if a hotel can figure it out, so can you. "But how will I support all these devices?" Well, you're supporting users connecting from home with non-company devices today, right? So how is this any different? "I can never allow non-trusted devices on the corporate network"
You need to redefine your definition of "corporate network." 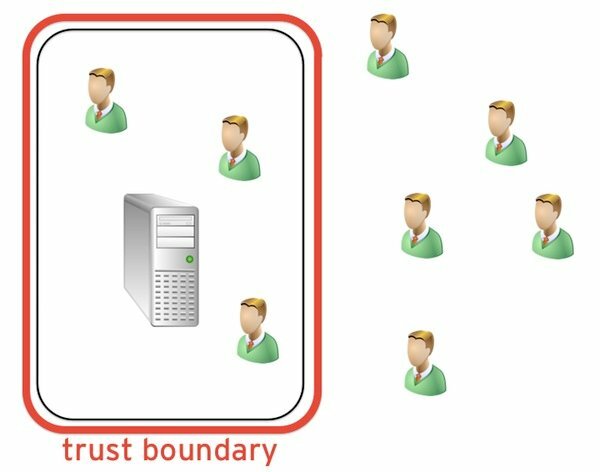 Your corporate network is the tight boundary that's around your servers or whatever else you're actually trying to protect. There's no point to protecting your entire user-land network. Just make it "the internet" and move on. Actually, that's a good bottom line to summarize this whole concept. You can't protect the user-land network, so don't even waste your money and time trying. Instead spend your money and effort where it can actually be effective, buying a decent SSL-VPN solution, good networking gear, and modern WiFi hardware. Done. Well said and completely agree. Been saying it for a year ;) However the notion of making "open" or WEP wifi is a puzzling. I have WPA2/PSK on my wifi at home to keep someone from simply capturing data from the air. Judging from my neighbor's wifi I can see from my house they do the same. I wouldn't want LESS security in the office. A simple key/WPA2 wouldn't be very onerous and would be MUCH better than WEP which is easily hacked . I would posit that the server security boundary should NOT contain DV servers either. They are not any different than any other desktop. Well said. Far too much attention is devoted to the various devices and no enough on the network and data. With a growing BYOD focus the most important component is always to protect data access -- after all that is one thing that is always the enterprise's responsibility. This approach also opens up IT to build on the user relationship. Yeah I agree that WPA2 would be fine too and also compatible with everything, but if your VPN boundary is done right than it shouldn't matter. After all most public networks use no encryption at all and you have to be confident with your users there too. But of course, if you're going to enable encryption, yeah, may as well be WPA2 instead of WEP. Also I LOVE the idea of having your VDI servers outside that boundary. YES YES YES!!! 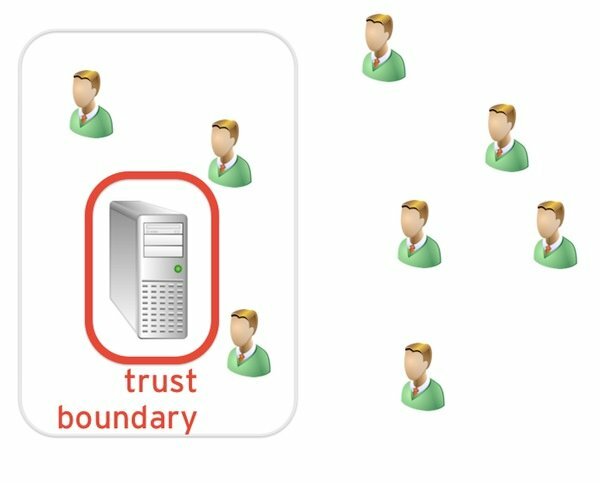 +1 on VDI connection/security servers outside boundaries. The project name of my first VDI deployment was "Alternative Access". It was exactly this premise that while we in IT feared giving just any device 'equal' access, providing everyone an 'alternative' means of access in the event they can't pass NAC policy/controls would be the next best thing. With regards to WEP/WPA/WPA-2/etc. - Sure. Dual-SSID's would make sense, but why not deploy a 'pay-wall' style solution exactly like airports, hotels, etc to make sure zero-day devices like the Microsoft Watch could also enable employees to auth in from a wide-open SSID ? This is actually going back to 2004 when NAC (Network Access Control) market became a hot topic and eventually led to UAC (Universal Access Control) markets. At Juniper, we first solved the "untrusted locations", "untrusted devices", "external users" with an SSL VPN solution to provide end-to-end security. Then we realized that most security threats were coming from inside with mobile workers. So, we came up with "location-agnostic", "device agnostic" secure access for both inside and outside access -- using SSL VPN model. In fact, at Juniper, we used to route all access from the Wireless Access Points to an SSL VPN device so that every Wi-Fi access from any device, any user, any location is secured. However, inside the network you would have problems of the "network throughput" to secure every connection through SSL VPN, so we used IPSec with NULL encryption to minimize the overhead in the LAN-only use case. Net-net: Every access to a resource from any device, any location, any user, a need to provide the same level of secure access like an SSL VPN device. In fact, I saw this as running VPNs everywhere for every acces -- resulting in a notion of "Fully Private Networks" (FPNs). In the mobile world and consumerization, this is absolutely necessary. At WheelZ, we are trying to unveil the vision of FPNs with application specific security addressing the end-to-end security, including both data-at-rest and data-in-transit.